Which colours will the Bori have on their special day? I think Woodland could be really neat on them. Biscuit seems like a probable color fill. 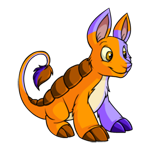 The Bori is another pet with a silly expression which would benefit from being covered up so I'm hoping for a Stealthy similar to the Grarrl. I'd also like to see another Dimensional (I guess there'll be a run of these anyway as it's a new colour).